It was four years ago that cricketer Virat Kohli and actor Anushka Sharma first featured as a couple for Hindustan Unilever's Clear Shampoo commercial. Now, as the two have tied the knot, the celebrity pair could take their advertising relationship to the next level. While the two have appeared together for the second time in a recent ad for apparel brand Manyavar, they are sure to be much more in demand, celebrity management sources say. Real estate, jewellery, cars, and consumer goods are among the categories where the couple could appear together over the coming months, sources said. 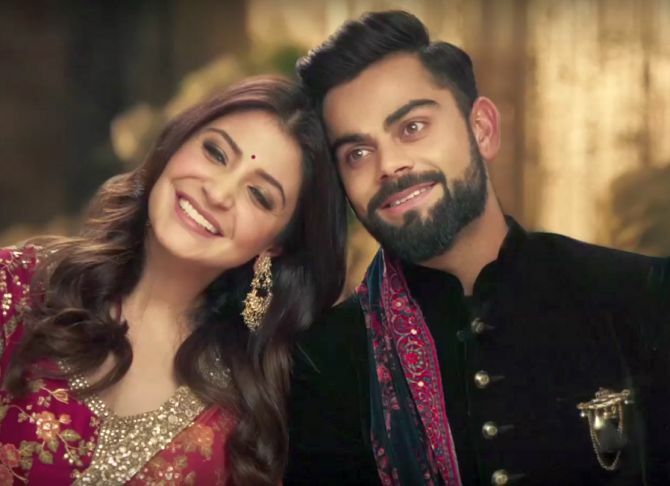 Kohli and Sharma are set to join the likes of Ajay-Kajol, Akshay-Twinkle and Amitabh-Jaya, who have featured in couple ads recently. Ajay-Kajol have appeared for brands such as Lifebuoy, Akshay-Twinkle for PC Jeweller and Amitabh-Jaya for Kalyan Jewellers, respectively. Couple endorsers typically charge in the range of Rs 4 crore to Rs 5 crore (Rs 40 million to Rs 50 million) to Rs 7 crore to Rs 8 crore (Rs 70 million to Rs 80 million) per brand, depending on the advertiser's ability to shell out the big bucks. Virat-Anushka are likely to cross this threshold and charge nothing less than Rs 10 crore to Rs 12 crore (Rs 100 million to Rs 120 million) per brand given their popularity and appeal with the youth, sources in the know pointed out. "Virat is the captain of the Indian side and Anushka is an A-list Bollywood actor. Something like this has not happened before though there have been instances of Bollywood and cricket stars coming together," Indranil Das Blah, founding partner, Kwan Entertainment & Marketing Solutions, said. Virat-Anushka, in a sense, are celebrity royalty, he added. "And advertisers will seize the opportunity to cast the two together once they are through with marriage." The speculation around a likely wedding gathered steam after the two were cast as a couple in Manyavar's Diwali commercial this year (see picture). Earlier in 2013, the shampoo commercial featuring the two had set off talks of they being in a relationship. "Their popularity make them a top draw with advertisers. Wherever brands wish to convey the message of a young couple taking decisions together, they could be used," Hitesh Gossain, brand expert and chief executive officer, Onspon, a Mumbai-based start-up, said. Kohli individually endorses a number of brands from Puma to MRF, Audi to Colgate and has emerged as one of India's most successful batsmen. Recently, the International Cricket Council placed him in second position, behind Australia's Steve Smith, in the list of batsmen playing Test cricket. Sharma has also marked her presence well in big-budget movies such as PK and Sultan. She has produced small-budget films including NH10 and Phillauri. Brands she endorses include Nivea, Acer and Mohey women's wear among others. This declaration by Kohli will melt your heart!